After weeks of heat and humidity, and periods of showers, and occasional severe thunderstorms, the Stateline is enjoying some absolutely fabulous weather for this time of year. Temperatures are cooler, the humidity is much more comfortable, and the rain has stopped for the time being. Enjoy this interlude while it lasts because you know that the heat and humidity will return before too long, and so will the threat of more thunderstorms. Why is the weather so nice right now? Well, we have a ridge of high pressure from Canada reaching right down across the Stateline. Skies will be sunny to mostly sunny under the influence of this ridge through Saturday. It will be comfortable today, and cool again tonight, but temperatures will slowly warm a little each day, and by the time the weekend arrives, it will be back up in the upper 80's again. Humidity levels will increase, and become uncomfortable by Sunday, the 4th of July, and scattered thunderstorms will be possible later in the day. A front will stall out over Minnesota and Wisconsin on Sunday, and lift back to the north on Monday. With a rich flow of tropical moisture, there will be continuing chances of thunderstorms through Monday night or early Tuesday when a new cool front will push the warm and muggy air off to the east. The pattern has shifted, temporarily, and the Stateline is benefiting from a northerly air flow out of Canada. An upper low is spinning eastward across northern Ontario provience across James Bay. A nice northerly flow has developed from central Canada into the midwest behind the slowly departing upper low and an elongated ridge of surface high pressure. That ridge stretches all the way from Greenland across Baffin Island, the western part of Hudson Bay, western Minnesota, through Kansas City, and then southwest across the Oklahoma panhandle into the southern Rockies. The ridge is very slow moving, so the Stateline will have an extended period of dry weather with sunny days and clear nights through Friday. Temperatures will be cool today and Wednesday with afternoon highs in the middle 70's, and nighttime lows near 50 degrees. There will even be a few places where temperatures drop to the upper 40's tonight. By Thursday the ridge will be just east of Illinois, so temperatures will start to edge up, but it will still be close enough that it will remain dry through Saturday night. By Sunday the southerly wind flow will be loaded with moisture again, and temperatures will be between 85 and 90 degrees. The 4th of July may have some fireworks provided by "Mother Nature". The could be some scattered thunderstorms on Sunday and Monday. We've got a pretty nice weather pattern setting up over this entire week with lots of sunshine and temperatures sitting in the "comfy" range. That may be changing as we head into the weekend as the trough in the west begins to propagate east and bring return flow and warmer temperatures. While this normally wouldn't be much of a concern, what is left of Alex could get caught up in the upper level flow which would potentially steer it closer to the Midwest...which could bring a rainy fourth of July. I've decided to leave the forecast dry for now until we can get a better handle on 1 - the path of Alex and 2 - just how far the trough will move east. Hopefully things will hold off at least until Monday so we can get the fireworks in. Alex still expected to gain strength as it moves over the Gulf of Mexico. As a result, a Hurricane Watch has been issued for the coast of Texas south of Baffin Bay to the mouth of the Rio Grande. The government of Mexico has also issued a hurricane watch for the mouth of the Rio Grande to La Cruz. It's the first named storm of the 2010 Atlantic Hurricane season! Tropical Storm Alex continues to become better organized as it slowly moves away from the Yucatan Peninsula this morning. Maximum sustained winds are now at 50 mph (remember 74 mph earns a Category 1 status) and moving to the northwest around 6mph. Currently there are no coastal watches or warnings but Alex is expected to gain strength as it moves back into the Gulf of Mexico and could become a hurricane later today or tomorrow. For a look at the projected path click here. The good news is that a high pressure ridge over Florida should keep it on a westerly track either making landfall later this week across the Mexico/Texas border. Next update will come out around 10am. The first in as series of cool fronts is sweeping across the northern part of Illinois as the pattern switches from being very warm and humid with repeated rounds of thunderstorms to cooler and drier with very comfortable conditions for the next several days. The jet stream will be diving in from the north to our west for the next couple of days allowing Canadian air from the Hudson bay region to overspread the upper midwest. There will be lots of sunshine, too There is a possibility of some isolated afternoon showers on Monday to the north of the Wisconsin state line as the next cool front barrels in from the north. There will be a limited amount of low level instability which could kick up some showers mid-day through the afternoon. Other than that it is expected to be mostly sunny on Monday with fair weather cumulus clouds gracing a beautiful blue sky. Skies will clear on Monday night and the Stateline will see the coolest overnight low in several weeks, dropping to the middle 50's. A surface high pressure ridge from Canada will take full control of area weather from Tuesday through Friday as is inches slowly eastward across the area. Skies will be sunny in the daytime and clear at night. This is about as nice a period of weather that you can expect this time of year as we head into July. Temperatures will gradually warm as the high shifts to the east late in the week. By the time the weekend arrives the heat and humidity will return on the heels of a southerly wind. With the approach of the next cool front on Sunday, there could be some scattered thunderstorms. More Storms on the Way! A meandering front snakes it's way from northen Indiana through the Rockford area, Dubuque, Waterloo, Ia, to Sioux City Iowa. At 11:30 pm cdt a bowing squall line extends from near Eau Claire, Wis., east of Rochester, Mn., through Mason City, Ia., to just south of Spencer,Ia. Numerous resports of severe weather have been associated with the passage of this bow echo. The line is moving toward the southeast. A Severe Thunderstorm Watch has been issued until 5 am for Stephenson County in northwest Illinois. There are unanswered questions about the squall line at this time. What will it's arrival time be in the Rockord Metro Area, and will it still be causing damage when it reaches the north central part of Illinois. As of midnight Saturday night, a good estimate for the arrival would be between 2 am and 4 am. It is likely to be in a weakening phase by the time it gets to Rockford, but it may still be potent on it's arrival. The main weather problem associated with the line of storms will be wind damage. The Storm Prediction Center (SPC) has issued a severe thunderstorm watch for Stephenson, Jo Daviess, and Green counties through 3:00am Saturday morning. A complex of severe storms in Minnesota, Wisconsin, and Iowa will continue to move to the southeast overnight. Although these storms will gradually weaken after sunset, there is still a chance that some of them will keep their severe characteristics (60+mph winds, 1" diameter hail) into the overnight hours. In addition to this batch of storms, more storms will redevelop tomorrow afternoon and evening in the Stateline area. In fact, the SPC has the Stateline area outlined in a slight risk for severe weather on Saturday afternoon. A Severe Thunderstorm Watch has been issued for Jo Daviess and Stephenson couties in Illinois and Green county in Wisconsin until 3am. Storms moving through southern Minnestoa and western Wisconsin will continue to track south and southeast this evening and could bring damaging winds and hail. It's been nice to have a break from the active weather the past two days but it looks like it may be returning just in time for the weekend. Southerly winds the next couple of days will boost temperatures well above the "comfort" factor with highs sitting in the upper 80s and even some lower 90s, especially Saturday. The jetstream overhead once again will bring back the chance for thunderstorms both Saturday and Sunday. Tonight, we'll be watching storms that will likely develop northwest and move east/southeast overnight affecting central and southern Wisconsin by Saturday morning. Once that passes, the warm front will continue to track across the Great Lakes and provide another threat for a few storms. Sunday the cold front will come through and bring back the storm threat before it moves east. Both days hold the possibility of some stronger storms. 3N Amboy: Trees down on rte. 30. Roof off of building on rte. 52/Robins Rd. Emergency Management in Dixon: Rte. 2 flooded north of town, and 911 center hit by lighting... Lost communications. Town of Lee: 60mph gusts. Rte. 30/251 (South of Steward): Nickel hail/52mph winds. I-39 at mile marker 92: Semi rolled-over. A Tornado Watch has been issued for all of northern Illinois until 9pm. 1:00pm Update: A Tornado Watch may be needed later this afternoon as skies continue to clear ahead of the approaching cold front and upper level trough. Noon Update: Looking at the current visible satellite trends this morning and we're still under a fairly decent amount of cloud cover. We aren't clearing as much as previous thought. With that said...the moderate risk for severe weather has been shifted to the south a little but we are still fully in the slight risk. We are beginning to see some clearing out to the west in southern Iowa but question remains just how quickly northern Illinois and southern Wisconsin will begin to clear. Other factors are still in place as far as the timing of the cold front and upper level disturbance moving through and if we can clear out enough before the front moves through our severe weather risk will remain with hail, damaging winds and an isolated tornado can't be ruled out. We still do have lots of instability to work with so any bit of clearing will lead to storms later today! Chief Meteorologist Ty Shesky will have all the latest information for you later this afternoon. Severe Thunderstorm Watch continues for Whiteside,Winnebago, Boone, McHenry, Ogle, Lee and DeKalb counties until 10am. Tornado Watch has been dropped for Green, Stephenson and Carroll counties. Thunderstorms will continue this morning as what's left of the MCS moves across northern Illinois. As of right now, no severe weather is anticipated with this batch, however a lot of rain has been falling over the same areas. A Flash Flood Watch is in effect for all of the viewing area until late tonight. Later today, attention will then turn to later this morning and afternoon as an upper level disturbance moves across the northern Plains and into the Great Lakes. This, along with the cold front and low level instability, will likely lead to redevelopment and possibily new development of storms. THREAT CONTINUING BUT GRADUALLY DIMINISHING THROUGH LATE TONIGHT. We still are under a moderate risk for this afternoon as far as the severe potential. We'll continue to monitor things very closely this morning and try to have another update for you mid to late morning! (9:59:22 AM) nwsbot: LOT: Crystal Lake [Mchenry Co, IL] emergency mngr reports TSTM WND DMG at 06:30 AM CDT -- trees blown over in crystal lake and woodstock s of rt. 176. (4:06:14 AM) nwsbot: DVN: 6 W Dubuque [Dubuque Co, IA] trained spotter reports TSTM WND GST of E70 MPH at 04:03 AM CDT -- estimated 60 to 70mph wind gusts. 3:30am Update: Severe Thunderstorm Watch is in effect until 10am for Whiteside, Boone, Winnebago, Ogle, Lee and DeKalb counties. 2:30am Update: Storms continue to move east/northeast this morning across northern Iowa and southwest Wisconsin. The "warm front" has lifted north overnight and the potential for some shear along the front exists...and that's why we have the tornado watch until 9am. We'll be watching the southern edge of this complex for any development along with what almost appears to be a bowing segment trying to form just north of Waterloo, IA. That is currently were all the severe thunderstorm warnings reside. Another threat as storms move through this morning will be the potential for heavy rain. Radar rainfall estimates of 1.5"- 2" per hour have been seen. 1:30am Update: A Tornado Watch has been issued for Jo Daviess, Stephenson and Carroll Co. in Illinois and Green Co. in Wisconsin until 9am. Not too much has changed from earlier this morning. Skies are generally clear...dew points are up and we're watching the instability rise. All of the viewing are is under a slight risk for severe weather while northwest Illinois is still highlighted in a moderate risk. Things are pretty quiet right now...but we'll be watching an upper level disturbance that is currently in the northern Rockies that will begin to eject over the Plains later this afternoon. As it does, supercell storms will be likely over parts of the Plains and into Iowa. As the evening progresses, storms will likely form into a line and move from the Plains southeast across the Great Lakes by sunrise Wednesday. This line of storms will have the potential to produce very strong, damaging winds. While a storm can't be ruled out later this afternoon I still think best bet will be this evening and overnight. After dealing with storm potential tonight, much of north-central Illinois is highlighted in a moderate risk Wednesday afternoon! So we have some very active weather over the next 24 to 36 hours! Be sure to stay up to date and we'll continue to update things as needed this afternoon. Looks like round number two...or should I say three...will move in through this evening and overnight. The slight risk for severe weather continues for all of the WTVO viewing area while the far northwest part of Illinois has now been added into the moderate risk. While skies will remain mostly to partly cloudy this morning...there is some clearing to the west through Iowa behind this system. With the stationary boundary to the south the atmosphere will remain fairly unstable through the afternoon and any little outflow boundary or upper level disturbance will help generate storms. While we do have the potential for storms this afternoon, I think the big threat will come in the evening and overnight as storms that will develop off to the west merge together to form another linear complex. I'm starting to get a little concerned about the potential for another damaging wind event tonight. We'll continue to monitor things in the weather center and try to get another update later this morning. 7:00pm Update: A Severe Thunderstorm Warning is in effect for Carroll and Whiteside counties until 8pm. This storm is moving east at 30 mph and is capable of producing golf ball sized hail. The National Weather Service has issued a Tornado Watch for Ogle, Lee, Whiteside and DeKalb counties until 10pm. Stayed tuned for the latest information! It was the morning of storm complexes across the US earlier with one round moving just to the south...another in eastern Nebraska...and another in the Plains. While there were a few pop up showers/storms this morning our attention will turn to the west ahead of the next storm complex that is currently moving through Iowa. The southern edge of the storms will continue to gain strength and move into northern Missouri through the morning. We'll be watching for any redevelopment along the northern edge through the morning and afternoon. Our daily storm chance will continue through Wednesday before we can finally break out of this weather pattern. With any of the storms that move through the potential will be there for heavy rain and strong winds. As a result - the Storm Prediction Center has us highlighted in a slight risk straight through Wednesday. A quasi-stationary front lying to our south will be the focal point for recurring thunderstorm complexes forming over the plains, and then moving eastward to the north of the front in the overnight hours through Wednesday. A thunderstorm complex forming over SE Nebraska, and north central Kansas will is severe this evening. A bow echo has developed with damaging winds in northeast Kansas. It will continue to move in arc arc across estreme southeastern Nebraska and northeastern Kansas into northwestern Missouri. It is a part of a thunderstorm complex with several severe storm clusters stretching as far north as South Dakota and eastward into extreme western Iowa. This complex will get a nudge eastward across Iowa tonight as a disturbance over western Nebraska gets closer. A low level jest stream from the south loadeded with additional moisture is expected to stream into the complex overnight continuing to feed it with additional moisture. Very heavy rains are possible across Iowa overnight. Some lighter showers and rain will move across the Mississippi River by 3 am, and the complex of thunderstorms may reach the Mississippi River toward daybreak moving into the extreme northwestern part of Illinois. It is expected to be in a weaking phase at that time, but it will contine eastward across northern Illinois in the morning hours. Thanks for sending in your pictures! There is a quasi-stationary front lying east/west across central Illinois westward along the Iowa/Missouri border into a low over western Kansas. This front will be the focal point for recurring thunderstorm complexes forming over the plains, and then moving eastward to the north of the front in the overnight hours for the next 3 days. Storms over north central Kansas may reach northwestern Illinois late tonight, and weaken as they move into the Stateline area Sunday. Thanks to Jason Hardin who sent these pictures in Friday night of the storms as they rolled through Creston, IL (one of my old stomping grounds). 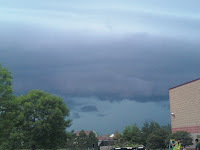 This is the shelf cloud (or the leading edge of the wind) of the storm. This is a good indicator that strong winds are about to arrive! Technically, the entire WTVO viewing area is under a severe thunderstorm watch until midnight tonight, but I do believe that rain with some rumbles of thunder is all we have to worry about for the rest of the night. These are pictures taken outside of the WTVO studio from our engineer Steve as the storms were moving through. We are looking off to the west. 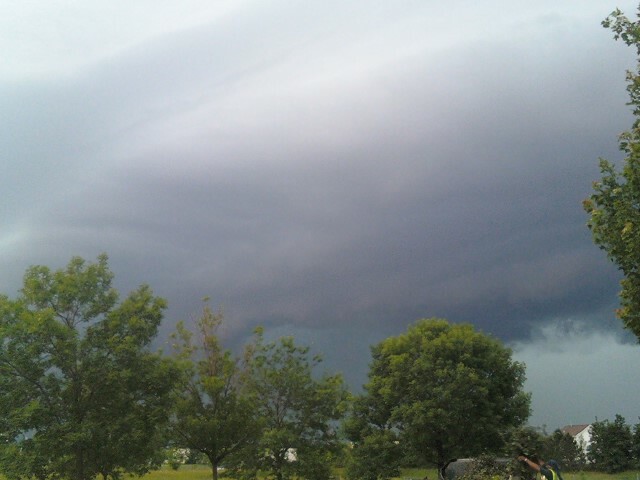 It's really neat to see the shelf cloud (leading edge of the wind) with these storms! Severe Thunderstorm Warning for Whiteside, Ogle, Lee and DeKalb Co until 8:30 pm. A line of strong storms continue to move east this evening with damaging winds the primary threat. 6:00pm Update: Severe Thunderstorm Watch has been extended until 9 pm this evening. A couple of storms popping up southwest of Rockford will need to be watched. The storms currently in Iowa could affect Jo Daviess, Carroll and Whiteside Co. within the next hour. While things are starting to quiet down somewhat this evening, another round of storms can be expected later this evening. Storms are beginning to redevelop out in Iowa and expected to move east. Looking at another round of damaging winds, heavy rain and hail. Stay tuned! (3:19:03 PM) nwsbot: LOT: Rochelle [Ogle Co, IL] trained spotter reports TSTM WND GST of E66 MPH at 03:10 PM CDT -- 66 mph wind estimated at i-88 and i-39. heavy rainfall. (3:17:51 PM) nwsbot: DVN: 4 W Freeport [Stephenson Co, IL] trained spotter reports TSTM WND DMG at 02:50 PM CDT -- 18 inch diameter tree down just south of highway 20. time estimated. 2:30pm Update: Severe Thunderstorm Warning continues until 3pm. We're starting to see reports of trees and power lines down across the area. 2:00pm Update: Severe Thunderstorm Warning for Winnebago, Lee and Ogle Co. until 3:00pm. These storms have had a history of producing wind damage. 1:55pm: Thunderstorm Wind Damage - Galena, Jo Daviess Co.
A Severe Thunderstorm Warning has been issued for Carroll, Jo Daviess and Whiteside Co until 2:30pm. A line of storms continue to move east out of Iowa and into Illinois and are capable of producing winds in excess of 70 mph. 1:15pm Update: A line of strong storms continue to move east this afternoon with several reports of wind damage across eastern Iowa. The strongest of the winds will move around the Davenport area where the line is beginning to bow out. Look for storms to cross the Mississippi River and move into western Illinois within the next hour. 12:15 Update: Severe Thunderstorm Watch will likely be issued for the remaining viewing area for this afternoon. 11:30 Update: All of the WTVO viewing audience is now under a moderate risk for severe weather. Damaging winds will be the primary threat with these storms. Storms to continue to develop around the Des Moines area this morning and will rapidly move east through the rest of the morning and afternoon. The sunshine that we are experiencing now will help to fuel the storms as they move into the Stateline. The atmosphere is just so that storms will continue to form into linear segments with bow echos along the leading edge. The biggest threat as these storms move through will be significant wind damage. Already starting to see reports out of Iowa with winds up to 70 mph! While hail isn't too much of a threat since temperatures are relatively warm aloft, there is a lot of instability so we can't rule it out. Tornado threat seems to be limited due to the lack of shear, but there may be a spin up, short lived tornado along the leading edge of the storms. This is going to be a case where it looks nice out right now and with the quick nature of the storms the weather will turn ugly in a short amount of time. Timing of the storms looks to be around 2pm; give or take an hour. We'll continue to monitor things in the weather center so be sure to keep checking back! 10:40am Update: Slight Risk for Northern Illinois and Southern Wisconsin will likely be upgraded to a moderate risk. Skies are beginning to clear after this mornings convection and that could potentially lead to some stronger storms later this afternoon/evening. The Storm Prediction Center has added a moderate risk for this afternoon across parts of west-central Illinois, southern Iowa and northern Missouri and this does include parts of the viewing area. Storms firing now across northeast Nebraska and Iowa are developing along a cold front that will sweep through later today. As it does storms will continue to develop along and ahead of the front with storms moving in later this afternoon and evening. Damaging winds will be likely with some of the storms as they move through. We'll continue to monitor things and give another update later this morning. The Storm Prediction Center in Norman, OK has issued a slight risk of severe storms through 7am Friday morning for most of the viewing area... with the exception of southern DeKalb county. A long line of thunderstorms stretching all the way from Minnesota and Wisconsin through Iowa, Nebraska, and into far northern Kansas as of this writing will continue to move to the east overnight. These storms are capable of producing quarter-size hail and wind gusts in excess of 60 mph. Personally, I don't think this line of storms will maintain their severe characteristics this far to the southeast as the best upper-level support for severe weather is to our northwest. While it's nice to see a little bit of a break in the stormy weather pattern it will quickly return starting tonight and last pretty much into next week. We are still under the influence of high pressure this morning but a warm front to the southwest may "rain on our parade" later this afternoon if storms hold together. The warm front will lift to the north later today with stronger storms developing through parts of the Plains, Minnesota and Iowa. As the evening progresses, the storms will likely form into a cluster of storms and move east overnight and possibly into the Stateline early Friday morning. If that's the case heavy rain and damaging winds would be likely. The storms, however, may take more of a southeast track which would leave us dry for the morning. Once the initial storms move out - another round is anticipated Friday afternoon/evening with the cold front coming through. We are under a slight risk for severe weather Friday afternoon. While temperatures and humidity values will rise through the day adding to the instability, we may be somewhat capped initially so we may not see storms develop until later in the evening. Then if that weren't enough, the front will stall to the south over the next and wobble back and forth giving us storm chances straight on into next week. A Flash Flood Warning has been issued for Jo Daviess, Stephenson, Carroll and Whiteside counties until 7:45pm. Heavy rain continues to move across southwest Wisconsin and northwest Illinois this afternoon. Rainfall rates of up to 1" per hour could be possible as this system pulls off to the east/northeast. Watch for flooding on roadways and rises in creeks and streams. Heavy rain continues to slowly move northeast across eastern Iowa this morning with some reports of 1"- 2" falling; with several reports of flash flooding occuring. We had a couple of showers pass through this morning but look for the rain, and a few storms, to move in later this afternoon. With the slow moving nature of the storm, heavy rain could be a possibility through the day. These photos were taken from Jenn Walker in Roscoe Monday night! 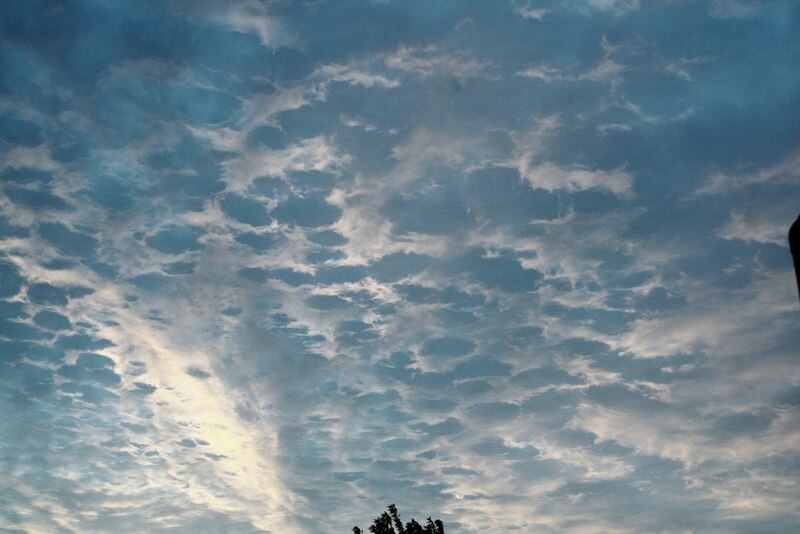 They are actually altocumulus clouds and the holes in them indicate dry air several thousand feet up trying to work in! Thanks Jenn for sending in your pictures. 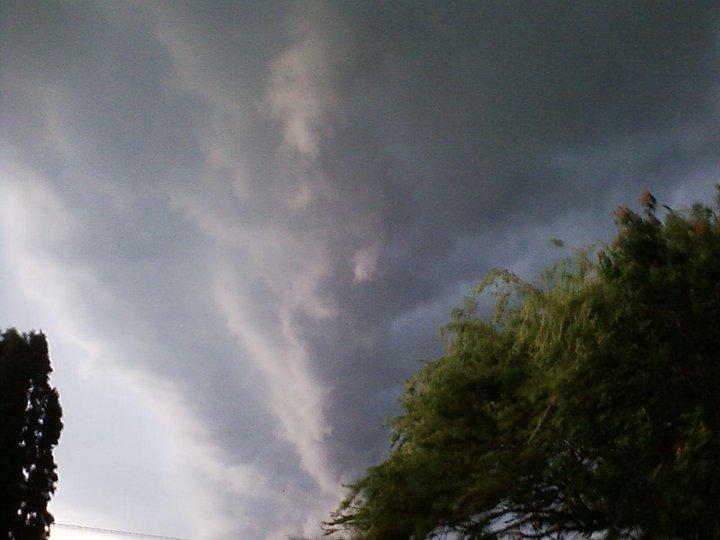 If you would like to send in any viewer pictures, you can email them to weather@wtvo.com! As we all know the 2010 Atlantic Hurricane season has begun and is forecast to be an above average season. This morning we are watching an area of low pressure that continues to show signs of organization. According to the National Hurricane Center, environmental conditions are expected to remain conducive for development during the next 24 to 48 hours as this system continues to move to the northwest around 15 mph. There remains about a 60% chance of this system becoming a tropical cyclone during the next 48 hours. What made this such a dangerous situation is that the rain fell at night while most people were sleeping and the remoteness of the recreation area made it difficult to relay warning information. We start the day with clouds, fog and rain...what a way to start the week! Rain is beginning to move into northwest Illinois this morning and will continue to move east through the morning. Look for rain to move into the Rockford Metro area within the next 30 mins. We are going to keep this rainy weather pattern going through today and tomorrow before seeing a little break on Wednesday. A quasi-strtionary front snakes it's way across central Illinois, northern Missouri, extreme southeastern Nebraska, western Kansas, the Oklahoma panhandle, across the northwest Texas panhandle into northeastern New Mexico. This front divides very warm and humid tropical high dew point air from considerably cooler air to the north. Disturbances will ride up along the front for the next couple of days. Nocturnal thunderstorm complexes are expected to develop the next two nights over the plains states along the front. Tonight's complex is anticipated to come together over northeastern Kansas and southeastern Nebraska. It will then move east/northeast along the front reaching the northwestern part of Illinois late tonight or early in the morning on Monday passing across the Stateline during the morning hours. No severe weather is anticipated at this time, but there could be some locally heavy rainfall. Daytime temperatures will be held down because of all the clouds. The Stateline will get a break from the rain on Wednesday with a good amount of sun, and afternoon temperatures reaching the low 80's as a weak are of high pressure settles across the area. The high will move fair quickly to the east by Wednesday night allowing the next system to approach the Stateline on Thursday. With winds switching back to the south, humidity levels will increase, with afternoon temperatures reaching the middle 80's, and there may be some thunderstorms back in the area with a warm front moving through from the southwest late in the day or in the evening. The Stateline will be in the warm sector between the warm front off to the northeast and the cool front approaching from the west on Friday. This will be very steamy Gulf air. The afternoon high temperatures will be dependent upon how much cloud cover there is, if there are any early afternoon thunderstorms, and the arrival time of the cool front from the west. If showers and thunderstorms and the front are delayed until late in the day, temperatures will be close to 90 degrees by 4 pm on Friday. It will be a less humid and slightly cooler day on Saturday with lots of sunshine, but temperatures will still top out a little above average, in the low 80's. The dry weather appears to be shortlived, though, with another warm front developing over the central plains and middle Mississippi River Valley, there could be some thunderstorms in the afternoon on Sunday. 10:40am Update: Storms are moving out of the area with a few showers left behind. While we'll see a little break the rest of this morning, we'll be watching the storms currently in eastern Iowa as they move across the Mississippi River later today. 9:45am Update: Severe Thunderstorm Warning continues for southern DeKalb Co. until 10:30am. A Severe Thunderstorm Warning remains in effect for Lee and DeKalb Co. until 9:45am. Storms developing on the southern edge of a storm complex are moving to the east/northeast at around 45 mph and will likely produce strong winds. They have had a history of blowing down power lines in Bureau County. 9:08am - Thunderstorm Wind Damage in Amboy - Lee Co.
9:50am - Thunderstorm Wind Damage in Cortland - DeKalb Co.
A warm front moved northward across the Stateline early today, and is now sitting over southern Wisconsin. All of northern Illinois is sitting under a tropical air mass this evening. Dew points are near 70 degrees indicating that we have loads of low level moisture. Some showers tried to fire up late this afternoon into the evening, but fizzled because of warrm air aloft, but with all the moisture in place there is the possibility that some scattered or isolated thunderstorms could get going this later this evening or later on tonight. As of 8 pm Friday evening the most significant action is far to the west in eastern Colorado and western Kansas and Nebraska. That is where last night's severe thunderstorms fired up. It could be that we will not see any thunderstorm activity all night with the intense thunderstorms far to the west. Questions to be answered... Will the storms in the plains hold together all night as they move east and northeast? Will the storms reach the Stateline in the morning on Saturday? There will be some thunderstorms passing through the Stateline on Saturday, but the timing is uncertain at this time. One thing for sure...It will continue to very warm and humid. Highs will be in the upper 80's. A cool front will start to ease southward into and across the Stateline late Saturday night into Sunday morning. There will be a good chance of some showers and thunderstorms with the frontal passage. With the front nearby on Sunday, scattered showers and thunderstorms will remain a possibility as cooler air oozes into northern Illinois. High temperatures on Sunday will reach the low 80's, and it will be cooler on Monday with a high only in the low 70's. Latest analysis shows the warm front beginning to lift across northern Illinois with a few pop up showers and storms along I-39 and points east. An area of low pressure has been developing in western Wisconsin and will be the focus for additional storm development later this afternoon. Instability parameters have been rising some within the past couple of hours but one limiting factor may be the warm temperatures aloft. We'll continue to monitor things through the afternoon and if any storms do develop heavy rain along with gusty winds and hail would likely be the main threats. 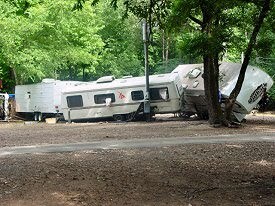 Flooding in Arkansas Claims the Life of at least 10 Campers! The cut-off low that was in eastern Texas the past couple of days has moved northeast and caused torrential flooding in parts of Arkansas overnight and this morning hitting Albert Pike Campground in Montgomery County, AR creating significant flash flooding. The top image is an *estimate* of where the water may have been at the time of the flooding and the bottom image is radar estimated storm total rainfall. (6/11/2010 3:14:17 AM) nwsbot: LZK: Albert Pike Recreation [Montgomery Co, AR] law enforcement reports FLASH FLOOD at 03:05 AM CDT -- high water problems were reported at the albert pike recreation area. 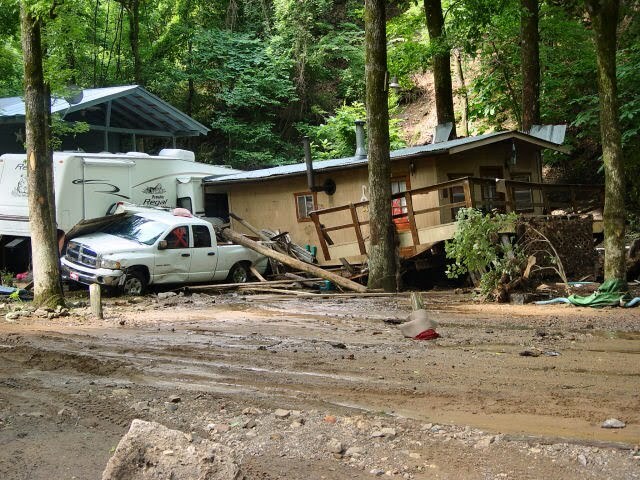 (6/11/2010 3:36:59 AM) nwsbot: LZK: Albert Pike Recreation [Montgomery Co, AR] law enforcement reports FLASH FLOOD at 03:30 AM CDT -- law enforcement was trying to move campers to safer locations around the albert pike recreation area...with high water rescues expected. 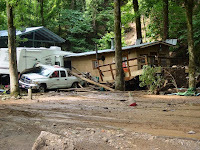 (6/11/2010 8:15:38 AM) nws-john.robinson: There are confirmed fatalities in the flash flood at Albert Pike Campground in the southwest corner of Montgomery County. Search for others is ongoing at this time. 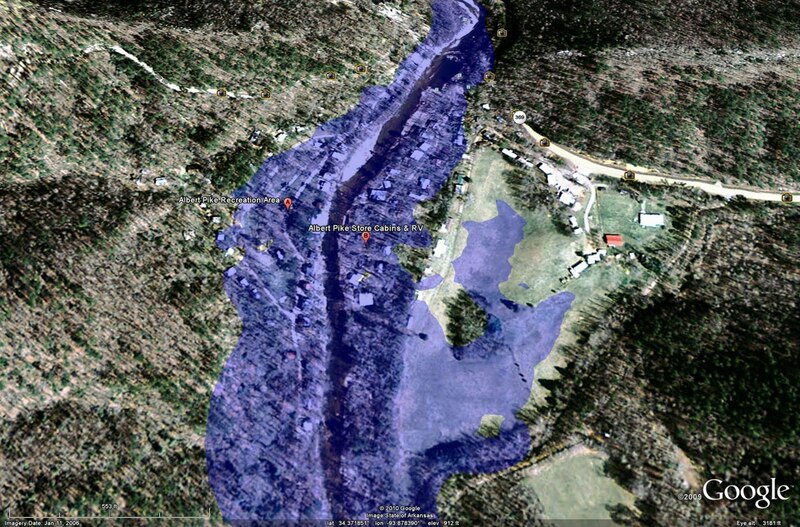 (6/11/2010 8:22:39 AM) nwsbot: LZK: Albert Pike Recreation [Montgomery Co, AR] emergency mngr reports FLASH FLOOD at 03:13 AM CDT -- *** 4 fatal *** this information is preliminary. emergency management reports at least 4 flash flood fatalities at the albert pike campground in the southwest corner of montgomery county. a search is underway at this time for additional campers...but it is unknown at this time how many other people might be missing. (6/11/2010 9:21:30 AM) nws-dan.j.koch: We don't know exactly where the deaths occurred at the Albert Pike Recreation area, but we have a survey team headed out there at this time. (10:49:44 AM) nws-dan.j.koch: We are estimating 6-7" rainfall in the area around the Albert Pike Recreation area that created the flash flooding overnight. This is based on radar reports and rain gage totals. Clouds continue to filter sunshine this morning ahead of a thunderstorm complex currently moving through northeast Iowa. These storms are moving off to the northeast so we should remain dry through the morning hours. What we'll be watching through the afternoon is the southern edge of this complex along with any interaction between outflow boundaries that have been left over from this morning and the warm front. This could provide for a few more storms later today. As a result the Storm Prediction Center has Northern Illinois in a slight risk for this afternoon. We'll continue to monitor things through the day and update you with the next outlook around 11:30 am.